Writing this book has definitely been a challenge these last few years, but I'm very pleased with the way it’s coming together and can’t wait for it to finally be finished and out in the world. I’ve gone off social media again, so stay tuned to my website, or subscribe to my newsletter, to find out more about the eventual release of the book. You can also follow me on Amazon. BUT I am still plugging away and growing VERY excited at the thought of finally finishing the book and getting the next leg of Erynn’s journey out into the world. 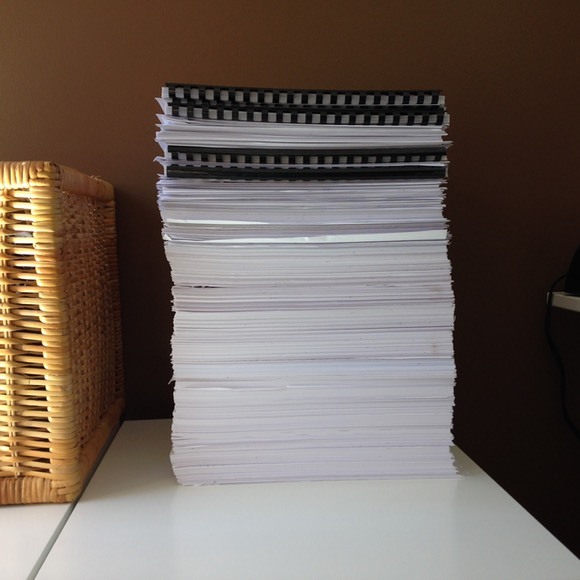 The photo below was taken back in June and shows all of my drafts up to that point (much of my writing takes place in between the lines and around the margins of my printed drafts). It currently clocks in around 152,000 words, and that’s another reason it’s taking so long. Longer books take longer to write! Although I am still unable to provide a release date, I will do my best to post more frequent updates here on my website, as well as through my newsletter and social media accounts. For those who haven’t yet read my books, or know someone who might like to, my ebooks will continue to be available for FREE to Amazon Kindle Unlimited members until August 22. After that, my ebooks will no longer be exclusive to Amazon and I will be redistributing them to other online retailers (including Barnes & Noble, Kobo, iTunes, and Smashwords). It might take a couple of weeks for them to show up on those other sites, but they will be there eventually! THE LAST FALCON will be available for FREE download at Amazon over the next 5 days: September 5 through September 9. After a year and a half away, I have now rejoined Twitter!